Last week we collected the landrover after its MOT and quite fortuitously the garage is near a Waitrose so I went along to get some butter. 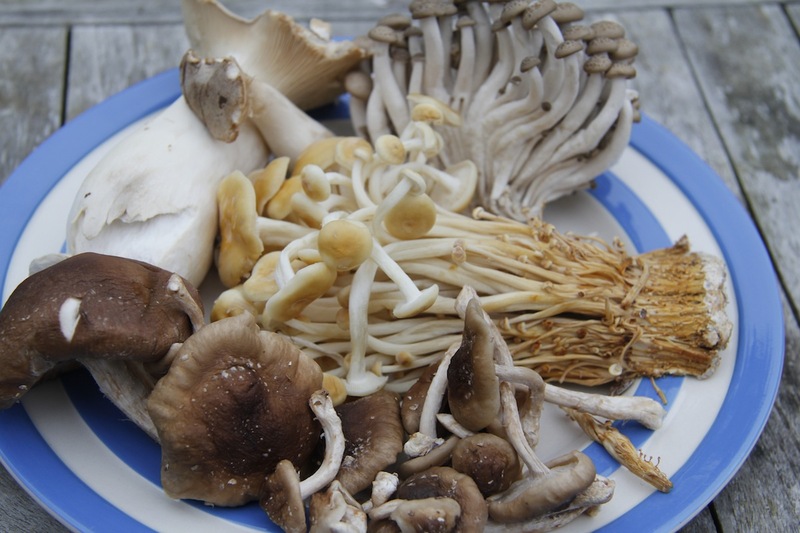 These wonderful exotic mushrooms (including buna-shimeji, eryngii, golden enoki, shiitake) were discounted and as we rarely get to eat mushrooms I bought them. I wasn’t sure what to make with them, but decided on a version of a vegan sukiyaki which is a Japanese hotpot dish. I really like Japanese food, but I tend to go through periods of making it. I wanted to take a picture of the ingredients, but the light at the end of the day is always better out in the front garden. 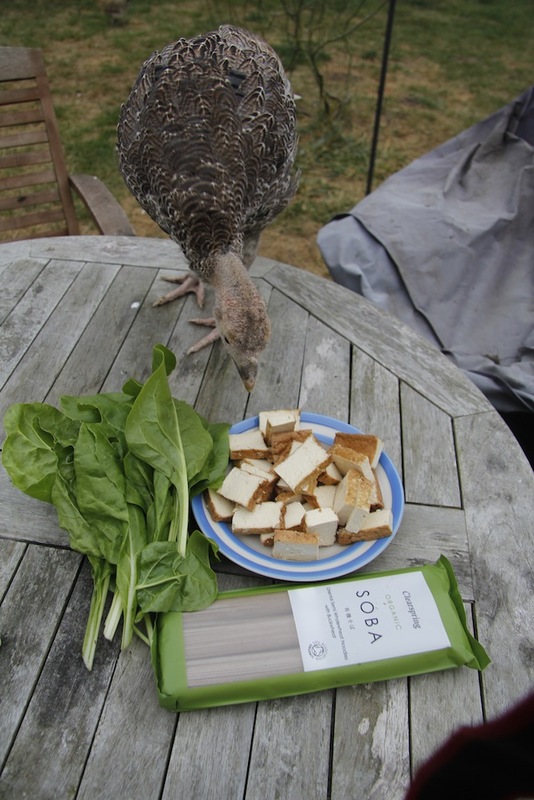 As you can see one of the turkey chicks was curious about our dinner. 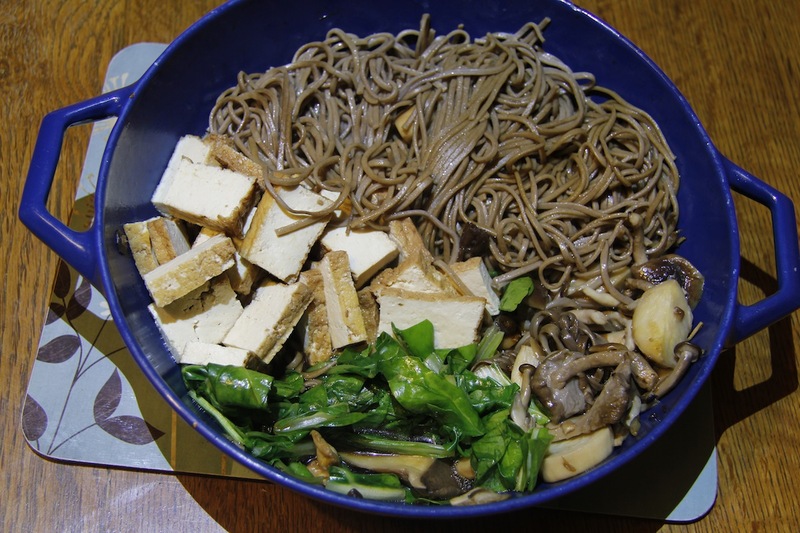 Sukiyaki: marinated tofu, soba noodles, mushrooms, swiss chard (of course), 1/4 cup of mirin, 1/4 cup of tamari, 1/4 cup of saki, sesame oil, some water. Cook the noodles and mix with some sesame oil. Chop and gently fry the mushrooms in a casserole pan. Push to one side and cook the chopped swiss chard. Add in the noodles and tofu. Mix the liquids together, add a little water and pour over – bring to the boil and simmer for a few minutes then serve. It was a Friday so we were busy on the site and didn’t eat until late so the photo is not very good., but the sukiyaki was delicious.